One of the most exciting aspects of this was that it took place in a converted church. 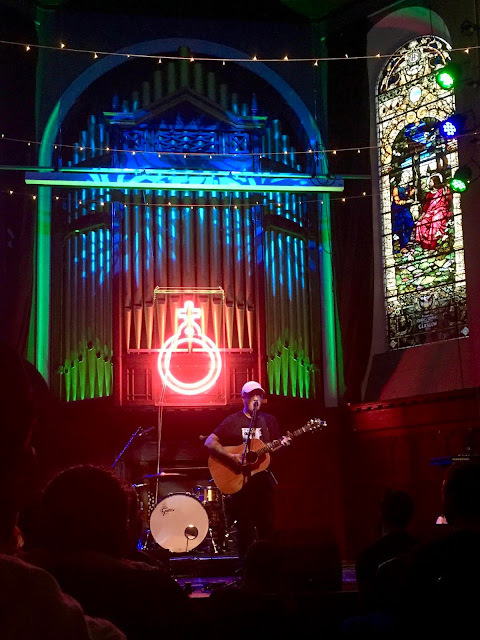 It's called Saint Luke's, over near the Barrowlands, and the church is now a live music venue, and there's a bar and restaurant attached to one side, which is The Winged Ox. That part was open when I arrived, but everyone had to wait outside for Saint Luke's itself to open. 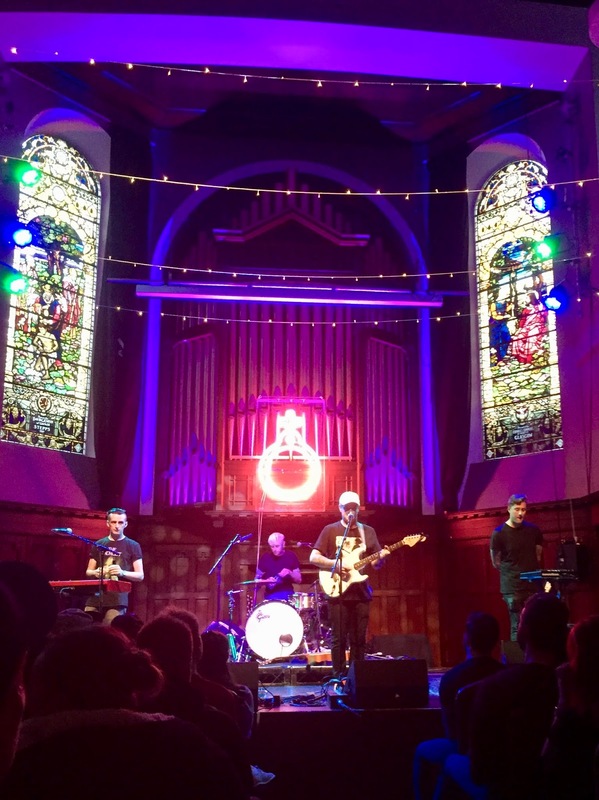 It's a stunning venue, with the organ pipes and amazing stained glass windows overlooking the stage. 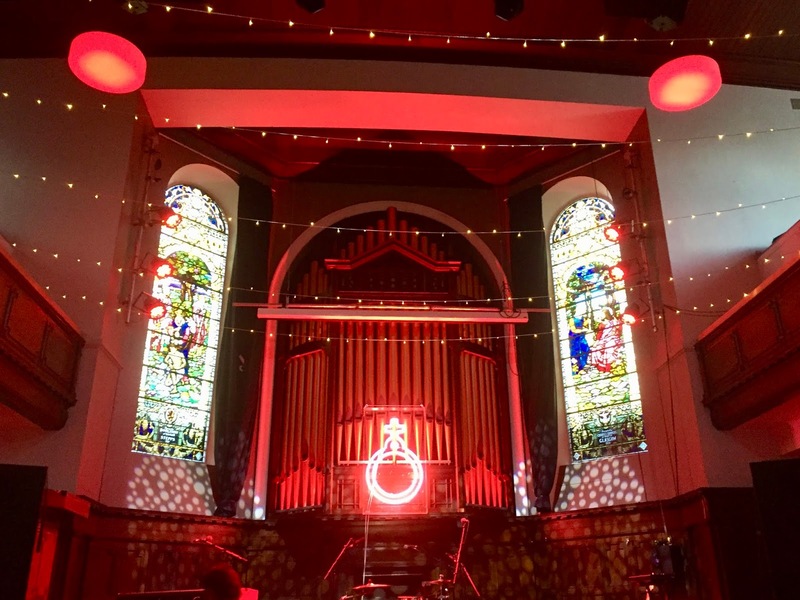 The symbol that the band are using for 'Rituals' was hung up in neon over the organ, and fairy lights were strung across the roof, between the balconies overhead. It was absolutely beautiful, and then it was even more fitting since the entire album uses religious themes for the song titles, so it all sort of made sense, with the words and the venue interlacing to create a transcendent sort of experience. It's also a very small space, creating an intimate environment for the show. The room was laid out with chairs - quite different to most gigs I go to, which are standing room - and it was a much more relaxed experience than previous Deaf Havana shows I've been to. Everyone was so laidback, just listening to the music, having a couple of drinks, maybe singing along a little. No jumping around and going crazy - not that there's anything wrong with that, but it was nice to have something different and just chill out with the music for a while. There was plenty of conversation going on between the band and the audience too! They also had a little art exhibition on display as well, with images they used as part of the album artwork, which had been used as inspiration during the writing process. The show itself was fantastic, but I expected little else from Deaf Havana, having seen them in the past, so I know how good live they can be. I was particularly impressed given that they were down a keyboard player for the evening, so they had to switch up some of their arrangements, and there were moments where they just picked up instruments and improvised through songs. I liked that everything was stripped back, and there were some acoustic versions thrown in, as it gave everything a sense of rawness and simplicity. This was a contrast to the album itself, which they have said was written backwards, firstly on a computer, and then recorded live, and uses a lot more electronic synth sounds than their previous records have. There's a couple of videos I took over on my Instagram, in my latest post and my story highlights! Yet they made it work. I had been a little concerned that this album was going to be over produced, relying too much on electronics and computers, so I was very happy that it wasn't, and that they can still perform it stripped back like this. I actually thought it worked really well, with the songs suiting live performance maybe better than on the album, as it became an entire experience, combining words, music, atmosphere, and emotions. 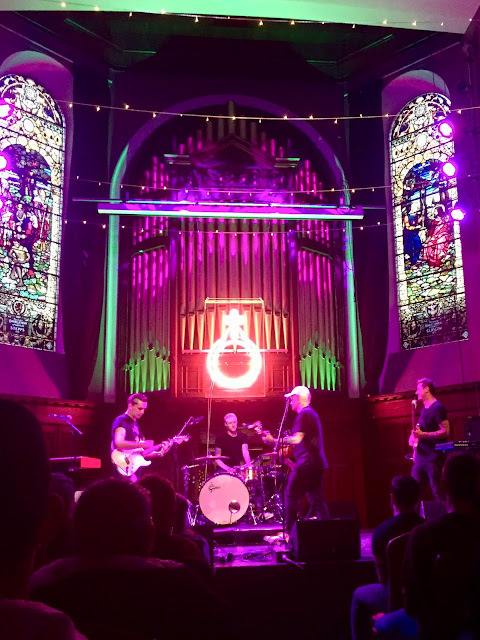 'Rituals' feels a little like a concept album, as the whole thing is based around a specific idea and way of writing, that is perhaps less organic than previous ones have been, but then it works well as a performance piece, especially in the setting of the church. It also proves their versatility and talent as a band, showing that they aren't afraid to experiment, and even though it's very different to their past releases, it still somehow feels like a Deaf Havana album, and they've made it work well! All in all, it was a lovely evening out, just being able to relax and enjoy the music, and soak up the entire atmosphere of the whole experience. My one tiny complaint was that it was too short - their set was around 45 minutes, which is fair enough since it's just a small release show, not a full tour set, but it took me longer than that just to get from Edinburgh to the venue, so I would've liked a few more songs! But that didn't detract from the overall experience, and it was a wonderful reminder of just how incredible live music can be.